Put the flour, yeast and the salt into a large bowl and add enough of the water to make a soft but not sticky dough. Knead well for 10 minutes by hand on a lightly floured work surface OR for 5 minutes if using an electric mixer fitted with a dough hook. 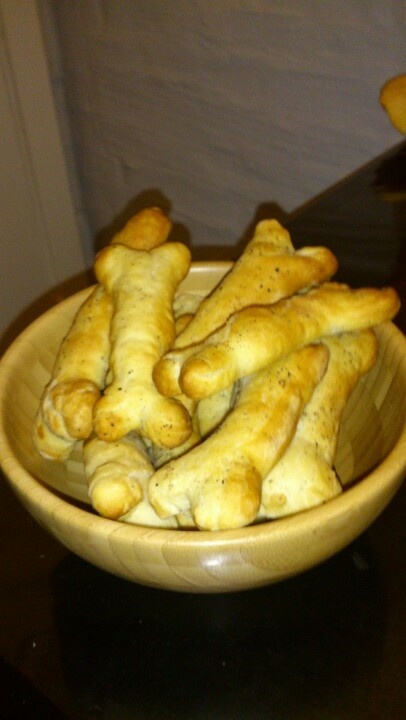 Place the breadsticks on the prepared baking trays, spacing them 4 cm. Cover the breadsticks loosely with oiled cling film, making sure it is airtight. Leave in warm place for 30 minutes, or until the breadsticks have almost doubled in size. Remove the cling film and brush each breadstick with the extra virgin olive oil. Sprinkle half of the breadsticks with the sea salt and the remainder with the freshly ground black pepper. Bake on the top third of the oven for about 20 minutes, or until the breadsticks are lightly golden-brown and feel firm to the touch. Remove the breadsticks from the oven and leave to cool on the baking trays.